Learn to Play with the Home Set : BALLCRAPS! THERE ARE A FEW SIMPLE CONCEPTS TO BALLCRAPS. A bet doesn’t count unless another player accepts it. You can remove an unmatched bet at any time. You can’t match a bet while a play is in progress. distinguish which player made the bet. Watch the video intro on how to play. Also check out the Learning Ballcraps playlist for a primer on how to play. on top of event you’re betting on. 2) Put an odds marker on top of the betting chips. To bet against the event, flip it to the stripe. 3) Another person matches your bet. 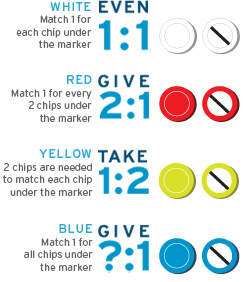 Each ballcraps player has a designated chip color, and all betting chips are equal. An unmatched bet is open for anyone to match. When the entire bet is matched, place the chips on top of the bet. To partially match, place your chips next to the bet. If there are two unmatched bets for the same event with the same odds, you should match the bet that was made first. When a challenge overturns a play on the field, all paid bets should be adjusted accordingly. As bets are won and lost, trade chips to consolidate your color. Click on an area of the board to learn more! Bet on how far a drive will go, or where it will start! The board convention is that the offense always goes left-to-right. Use the FIELD to bet on how far the drive will go. If you think they’ll reach midfield or better, bet at the midfield. If you don’t think the drive will stop before the red zone, bet against the 20-yard line. Drive distance bets are paid when the drive surpasses the bet, even if the drive ends behind the bet (e.g. because of a sack). A. If you bet for the left end-zone, you’ll win if there is a touchback. B. If you bet for the 20 yd line, you’ll win if there is a touchback or there is a return to the 20 or beyond. C. (Not pictured) If you bet for the right end-zone, you’ll win if it’s returned for a TD! If a kickoff is fumbled or there is a turnover, all bets for the return are lost. So if the kick returner turns the ball over at the 30 yard line, a bet for the 20 still loses. If a kick is returned for a touchdown, all bets for the return are winners. Bet on what will happen on the next play! What counts for a PLAY? Kicking plays (punts and FG attempts) do not count for PLAY bets, but fake kicks do count for PLAY bets. Pre-snap penalties do not count for PLAY bets. 3, 5, and 7 are bets for yardage on the play; “3″ wins for 3 or more yards resulting from the PLAY. Each play from scrimmage is either a PASS or a RUN. You can bet on which one it will be. A SACK counts as a PASS play. To simplify definitions and reduce arguments, a SACK is defined as the quarterback being tackled or running out of bounds behind the line of scrimmage. Intentional grounding counts as a SACK. Bet on consecutive plays with the boxes to the right of RUN and PASS. Consecutive bets can span across drives of both teams. Pay out any matched bets in the PASS boxes — the player betting against the pass has won the bet. Bet on what will happen during the drive! SCORE wins for either a TD or a FG for the offense. TURN does not win for a turnover on downs. FG only wins for a successful field goal. To bet for a TD, place your chips in the end zone of the FIELD section. Time out bets win immediately after a time out is charged to either team. Lost challenges count as a time-out. Penalty bets only win on accepted penalties. Bet on what will happen on the set of downs! TDs count as first downs. 3 & SHORT wins for 3rd & 3 or less. Bet on what will happen during the whole game! INT under “Home” wins when the Home team throws an interception. FUMBLE under “Home” wins when the Home team loses a fumble. If the team recovers its own fumble, this bet is not paid and remains active. The SACK bets under the “Away” count for the number of times the Away team will be sacked. In the GAME section, you can bet on 1+, 2+, 3+, or 4+ additional sacks in the game. A bet on “2″ is a bet that there will be two or more additional sacks in the game; this does not count any sacks prior to the bet. Bet on penalties, passes, or punts, whenever they happen next! NEXT PEN HOME wins if the next accepted penalty is charged against the home team. NEXT PASS COMPLETE wins if the next pass thrown is complete. Let it ride on any RUN, SACK, or accepted penalty play, such as Pass Interference. 10+ wins on 10 or more yards of return. Only accepted penalties count for Penalty bets.